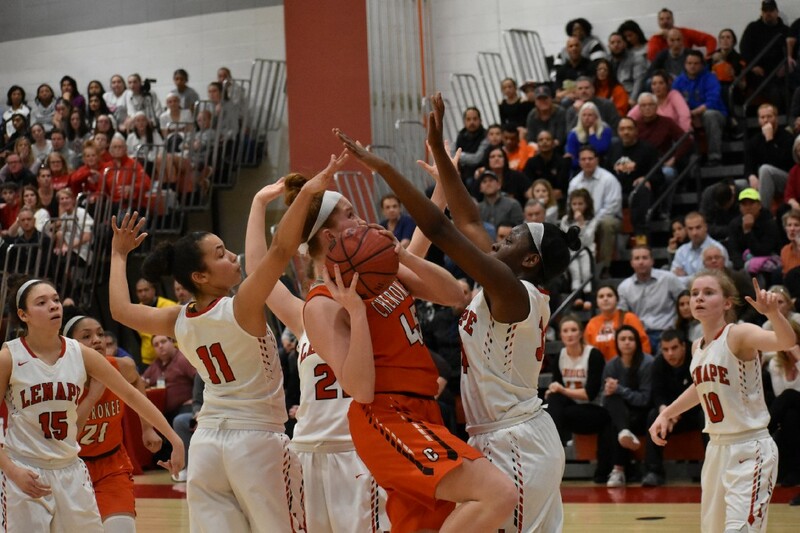 From sophomore Dyonna Wess’ strong defense to senior Shannon Mulroy’s leadership, the Indians put together a total team effort in a 41–30 win over Cherokee. 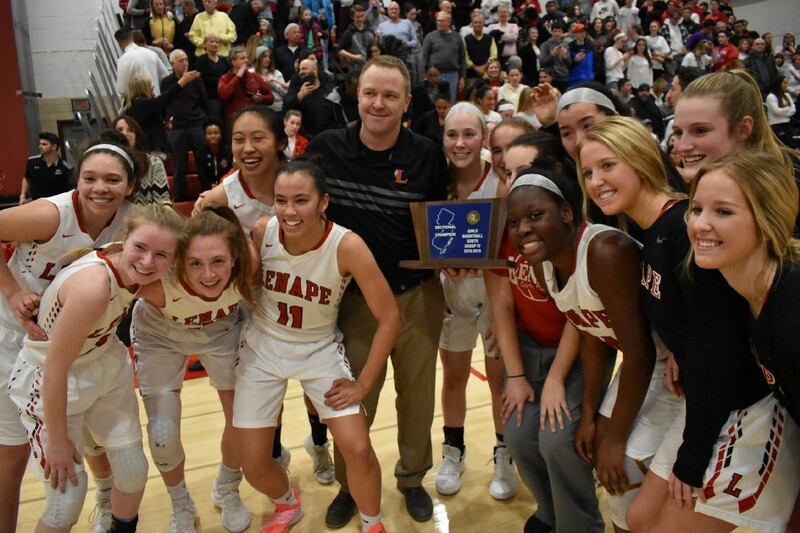 Lenape High school girls basketball celebrates after winning the South Jersey Group 4 championship on Tuesday night. One year ago, Lenape High School sophomore Dyonna Wess wanted nothing more than to just get on the basketball court. Wess missed her entire freshman season due to a knee injury. She served as the manager for Lenape’s freshman team and did everything she could to be a part of the program. 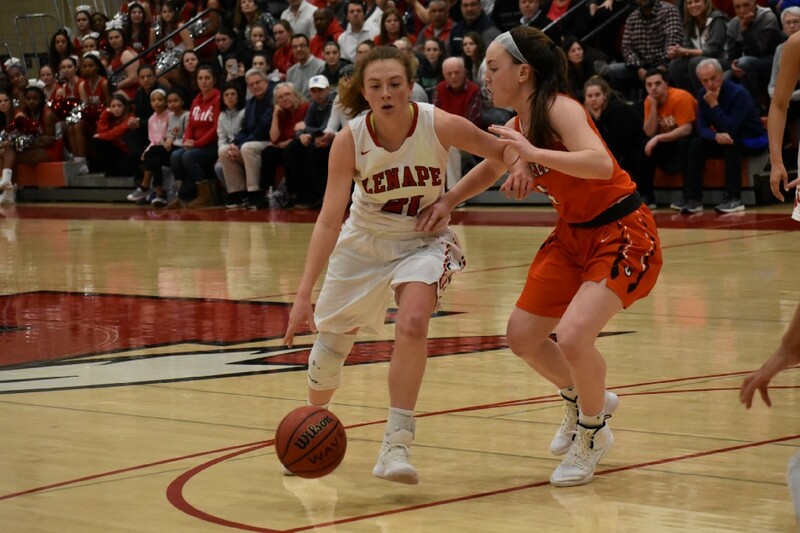 On Tuesday, Wess was not only back on the court, but she was in Lenape’s starting lineup in the South Jersey Group 4 championship game, guarding Cherokee High School’s own standout sophomore, Alexa Therien. Wess shadowed Therien for most of the game and was on top of Therien whenever she touched the ball, holding the Chiefs’ forward to nine points. Lenape’s Nevaeh Sutton (left) and Dyonna Wess (right) try to block Cherokee’s Alexa Therien from attempting a layup. Wess’ efforts didn’t reflect in her own stat totals, but it certainly reflected on the scoreboard. The Indians won their first South Jersey Group 4 title since 2016 on Tuesday as they defeated Cherokee, 41–30. Wess hadn’t played in a high school championship game before Tuesday. However, she didn’t allow the high stakes or the large crowd to intimidate her. Instead, she treated the game just like the previous two regular season meetings against Cherokee, games where she also guarded Therien. While Wess’ job on Tuesday was to guard Therien, head coach Rob Hummel said he gave Wess a variety of different assignments throughout the year and felt she performed well on many of them. Wess not the only player without championships game experience prior to Tuesday. Wess and junior Kiana Gosnell were both first-year varsity players who stepped up in 2019. Senior Nevaeh Sutton and junior Regan King were players who had previous varsity experience but took major strides this year as they moved into bigger roles. Shannon Mulroy tries to work her way past a defender in the first quarter. 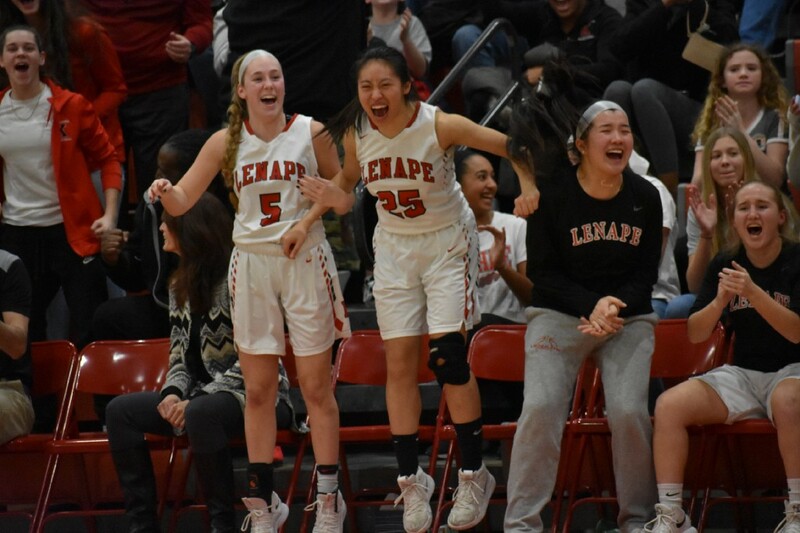 Early in the year, Lenape relied on Mulroy, the last player remaining from the 2016 state championship team and one of the top players in South Jersey, to carry a lot of the scoring load. As the season progressed, Mulroy had fewer games with 20-plus points. This wasn’t necessarily a bad thing, however. 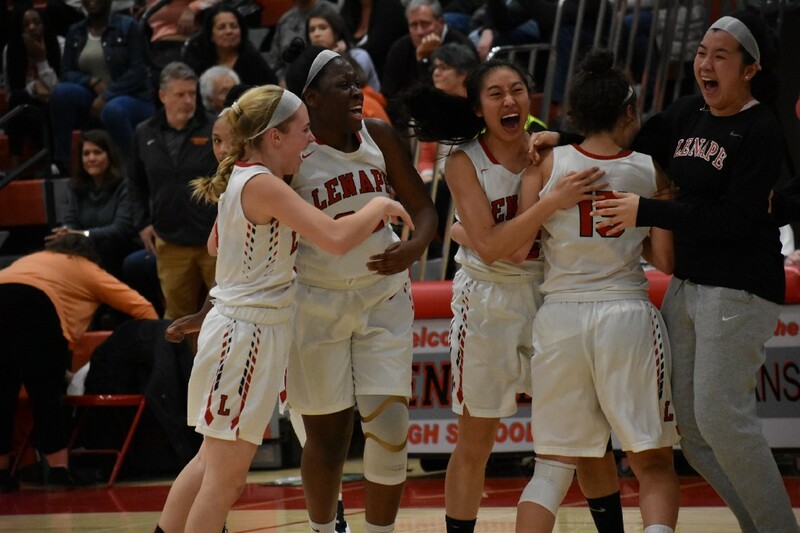 On Tuesday, Lenape showed how much it had grown as a team. Everyone had an important role, from Wess’ solid defense and Sutton’s four key blocks on defense, to King’s clutch three-point shooting in the second half and Mulroy’s leadership on the floor. Lenape celebrates in the closing moments of Tuesday’s South Jersey Group 4 championship game.